We offer to your attention the review of our most topical publications for the last month. One of the strongest trend that can be seen is the appearance of diverse dish constructions facilitating its transportation. Nowadays such a design is typical not only for Flyaway dishes but also for the models targeted for stationary applications. Most of them have sectional, detachable design. Some of them consist of petals (pic. 1), but more prevalent is an asymmetrical design that simplifies the dish assembling (pic. 2). One of the manufactures represented even more interesting design (pic. 3) Being folded, the this model looks like a stump, but when opened — transforms to a pretty big dish. Another point to mention is that dish dynamic adjustment technics have already been matured. 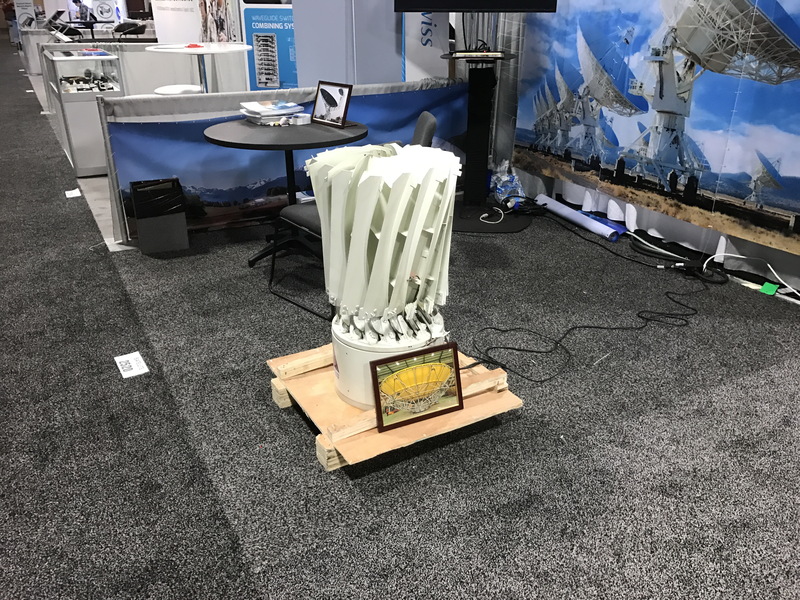 It’s about the systems based on a three axis gyro allowing to move dishes quick enough to use them on ships, trains and cars. The need for such systems is growing with the expanding demand for mobile broadband. One more aspect of the dish design development is the implementation of different anti-snow and anti-wind solutions The traditional way to avoid dish damage caused by wind is to use mesh design— which is widely used in Great Britain. And the most common way to fight snow and icing ( more topical problem for Russia) is to heat a dish is someway A British company offers a heating cover that can be put on the mesh dish to prevent icing and accumulation of snow on its surface. Another approach taken by American manufacture Walton De–Ice is to heat the Dish with the plates attached to the rare side of the dish. This solution looks more attractive but it is not economical. Walton De–Ice represented one more solution completely different from the first one. The dish is covered with a radio transparent cape equipped with a small engine. The engine causes the cape’s vibration which helps to shake the snow off. This solution is much more economical, compared to the previously mentioned — it consumes only 65 W while the heating system would require about 200-300 W per square meter. At the same time we should point out that for the Russia with its severe climate the most effective way of combating snow invented so far is to use a broom. We can point out two news items about Tricolor TV. There was not much of publicity around them; nevertheless they deserve attention as evidenced by numerous comments we got from our readers. 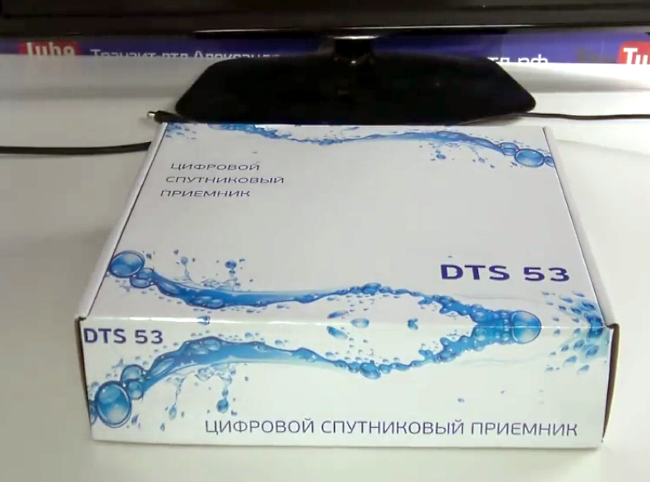 The first item concerns the appearance of a new STB for Tricolor TV reception, named DTS 53 (pic. 4) The interesting point is that this model is not produced by General Satellite – the Tricolor TV’s strategic partner which business mostly rely on this partnership. DTS is low-cost produced by unknown manufacture and does not allow to receive TV channels compressed in HEVC. It seems peculiar taking into account the fact that Tricolor TV is gradually migrating to HEVC. Besides DTS 53 has only HDMI interface on board and not equipped with RCA or SCART which would allow to use this low-cost device with obsolete TVs. MTC, the youngest Russian DTH platform with the smallest subscriber base, has started the campaign to attract more subscribers. Now to get MTC Sat TV service it is enough to obtain and install a dish. The STB for the service can be rented for 250 Rub per month and another 140 Rub should be paid for the basic service package. Our readers are rather pessimistic about the effectiveness of this campaign. Due to their calculations it is cheaper to buy the STB than to rent it if you are planning to get the service at least for a period of 1,5 year. The operator’s intention was to reach 100 thousand subscribers by the end of 2016 , but it is not disclosed whether it succeeded or failed. Norwegian Sat operator Telenor Satellite has launched a test broadcasting in DVB-S2X on Thor 7 (0,80 W). The service included the only channel protected by Conax and named «СD test». 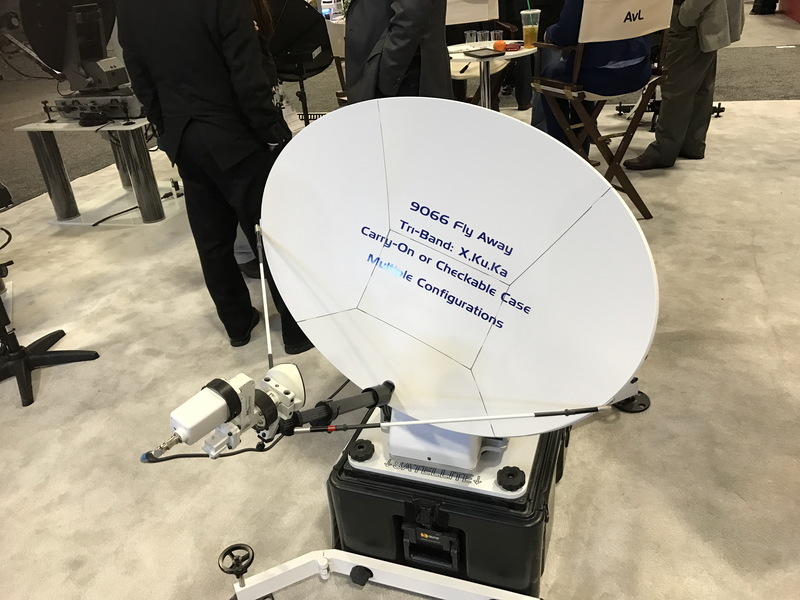 CD in high probability stands for Canal Digital – the name of the local digital satellite platform for which the testing is arranged. 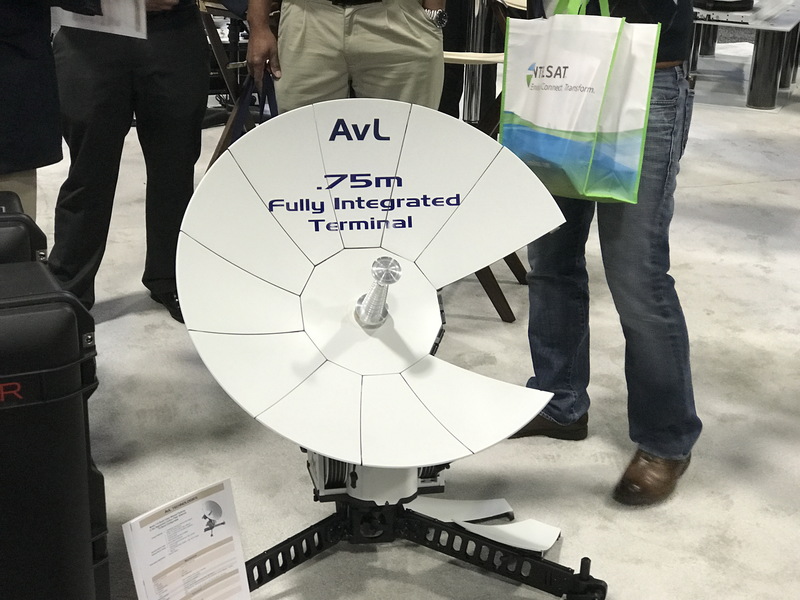 It is the first test conducted for a commercial SAT TV platform. Dream box has launched a new device at European market (pic.5) It is a triple tuner that supports DVB-S2X reception. It Includes two DVB-S2X and one DVB-C/T2 tuners, and allows to process simultaneously two TV streams. The device supports plug and play functionality and can be used as a part of Dreambox DM820 HD, DM7080 HD, and DM900 Ultra HD. The era of musical channels is approaching its twilight. This is the conclusion reached by our author after reading the article published on the Polish site satkurier.pl It was a publication about the transformation of a Polish rock-music channel to one more TV channel broadcasting pop clips. According to the author it is one more indication of the sagging popularity of musical TV channels. It is easily explained by the fact that young generation to which music channels are mainly addressed, long ago prefers to get music from the Internet. That is why musical cannels have a tiny fraction of Polish TV market. The only genre that retains a certain popularity on TV is Disco Polo. Why the Arab world is leading in terms of Sat-TV viewing ? There are several factors contributed to the huge popularity of SAT TV in Arabic countries. One of them is the lack of cable and terrestrial TV infrastructure. The second one is the fact that vast majority of Arab Sat TV channels are free-to-air — the standard of living in most of Arabic countries is quite low, and there is no market for commercial broadcasting. And since a single language is used in most of Arab world, the numerous FTA Sat-TV channels are available to many of neighboring states. And one more reason is the plenty of Arabic language channels that are broadcasting today from non Arab countries. This is related to the attempts of non-arabic countries to sustain stability in Arabic countries and diasporas . One more TV channel about auto-moto sport has recently appeared in Russia. To be more precise this channel has been offered in Russia before— it is the former Motors TV. This spring it was renamed to Motosport.TV , switched to Full HD and russificated. Now it has more chances to get popularity The channel covers such sport events as Formula 1 World Rally Championship , World Endurance Championship, FIM MXGP Motocross World Championship etc. The channel is offered to CATV and DTH operators with the delivery via the Internet. Some events are available for viewing from the Motosport.TV’s website. The recent Eurovision song contest held in Kiev was not transmitted by Russian TV because the Russian participant was not permitted to enter the Ukraine. Our edition made a review of Sat and on-line resources available to follow the contest from Russia. The review has been actively commented, but most of commentators believe that Eurovision is simply not worth seeing, particularly without a Russian participant.